I first learned the term, "Triple Threat", as a young basketball player in my midwestern youth in reference to the body position and situation while in possession of the basketball with the ability to dribble, shoot, or pass. When I came to Utah after high school to ski as much as humanly possible while I earned a bachelor's degree, I met a couple locals that would play pivotal roles in shaping me as a skier. Paul Wright was a mentor. Ben Geiger was a peer. 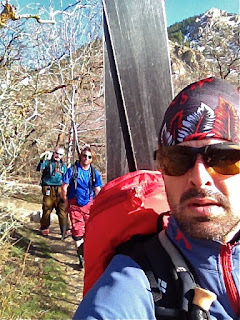 Both were with me a couple weeks ago when we completed a three canyon circuit tour in the Ogden backcountry thus forever changing my personal use of the words, "Triple Threat". ^Ben and I rolled up to the Snowbasin parking lot in the morning with a plan to complete the "Triple Threat" when we spotted Paul gearing up. As much as I'd love to publish the locations and slopes here I will defer the specifics for the sake of the local backcountry community in Ogden. It was locals that showed all these places to me, but I am not one to kiss and tell. Anyone who actually knows the area may recognize the pictures, but if they know the pics, then they already know the zones. Thus, I figure that gets me off the hook. The picture above displays Ben and Paul ascending on our first skin up to the ridge above our second canyon. Our first ski descent is in the background of the picture. It is so big that the tracks are not even visible from this distance. Zoom in on the picture to notice the three tracks in this chute in the first of the three canyons of the "Triple Threat" tour. It was kind of perfect that we had this trio for it. ^Canyon number two, and three beautiful tracks painted on the canvas of crystal white powder. I grew up taking art classes throughout my academic endeavors, and I must say that while skinning up and looking across the canyon at the tracks we were painting on the mountain side I was appreciating the beauty of it like any classical painting hanging in any modern museum. As any good art student knows, the eye of the beholder is the only place art can be defined, and I don't care what anyone thinks, this is art to me. ^In the picture above, and in our third canyon, Ben studies his line as we wait for Paul to get ready to enter his line in the background. Paul was a mentor to both Ben and I as we cut our teeth in the backcountry. Now that we have grown up and learned more about our backcountry lives we are both stoked to be able to share these kinds of experiences with him. Many of the names of the chutes and bowls we skied in these canyons were named by Paul. 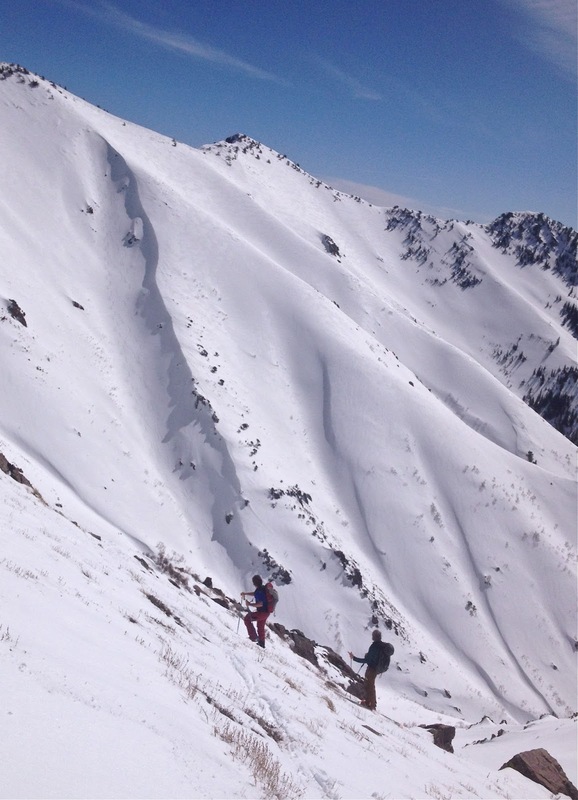 Ben and I always get a kick out of trying to find new lines in the Ogden backcountry that even Paul has not skied. Many times though just when we think we have found something new we find ourselves explaining the zone to Paul around a truck tailgate and a snowbank chilled beer when he chimes up with something like, "Oh yeah. I know that shot. We call that..." I am proud to say that we have indeed found some zones Paul has never skied, but not many. In a mountain range littered with decades worth of ski lines that is quite the impressive feat. For that same reason, we can still go out with Paul and he can almost always still show us something new. I don't really want to be smart as much as I want to be wise, and that kind of knowledge comes from mentors like Paul. That is all part of the backcountry community credo of having mentors, peers, and apprentices. Paul's humble nature would never admit my apprenticeship to him, but I am proud to have been mentored by him and totally pumped that he treats me like a backcountry peer now-a-days. ^Our third canyon and we laid down three more beautifully painted lines. My own in the foreground bowl, Ben's line hidden in the shady north face behind the shoulder to the left of mine, and Paul's line through the shady chute tucked into the corner of the bowl in the back of this picture. Three more lines in the third canyon and we had completed the "Triple Threat". Three big long lines in each of these three big canyons of the Ogden Wasatch Range. High fives and smiles all around, but technically we did have one more canyon to navigate to make it to the trailhead and the official completion of our mission. ^The heat of the day was beginning to set in. Our last ski of the day to exit the last canyon was a bit warmer and wetter then any of us would have liked, but this time of year in springtime that is just how it goes. Choosing a heavily gladed, sheltered, and north facing slope helped us manage the heating snowpack all the while allowing us to access the summer trail we needed to get to in order to hike out of the last canyon to the Ogden City trailhead and our waiting vehicle. ^The hike out on the summer trail finished off my legs, but I was pretty happy this time that I had brought some Teva sandals in my pack for the walk. There is not much better then peeling off ski boots after a long day touring to put on some sandals on a warm spring day for the hike out. Second only to the sense of relief for our trio when we finally reached the car, tore off heavy packs, and the three of us slap some exhausted high fives marking the official completion of our "Triple Threat".